Ken Nippress, a friend of ours at Cardington, reports that Zeppelin NT #4 arrived around 5.20pm local time, landed around 5.38pm and was on the mast at 5.42pm for hangar entry The winds were around 6 knots southwest and apparently all was very smooth. We checked our GPS tracking and saw that it captured the ship on the way. 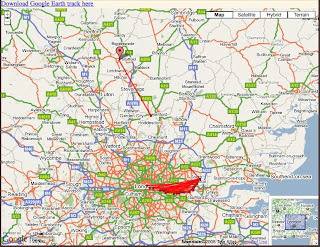 The red marks in london show the track of the airship during the tours. Looking at the closeup, it hasn't quite made it to Cardington when the last ping happened and if the airship was powered down before the next, then we won't have one at Cardington until the airship is next powered on! 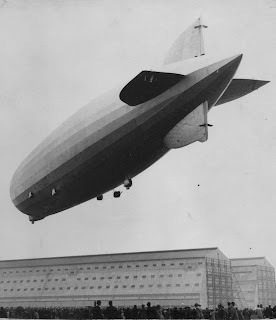 Ken reminds us that the last Zeppelin to visit Cardington, Bedfordshire, was the Graf Zeppelin on 26 April, 1930. The wonderful book, "Airships R-100 and R-101" by Michel Pratt has many photos of that historic occasion and is a really great read too. You can often find it on ebay at the store of the publisher. I have got some picture taken from the air at approx 5.35 after it passed over Henlow and we took off and followed it to Cardington. 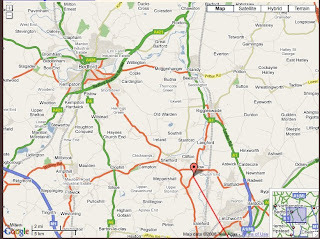 It it a magnificent sight.